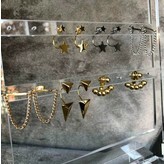 The small triangle stud is ca. 8mm width,the big triangle earring is ca. 16mm length.